We are all undoubtedly aware of adb. In fact, most of us use it quite often in order to execute commands on our mobile devices from the comfort of our computers. It allows you to do this such as push and pull files on the device, retrieve logcats to send to your favorite dev when your kernel causes a bootloop, reboot to recovery or bootloader, and many other useful things. It is also the core of most one-click root methods. Ultimately, it is the adbd (ADB Daemon) that is responsible for allowing you to access the shell and all the other cool functions. 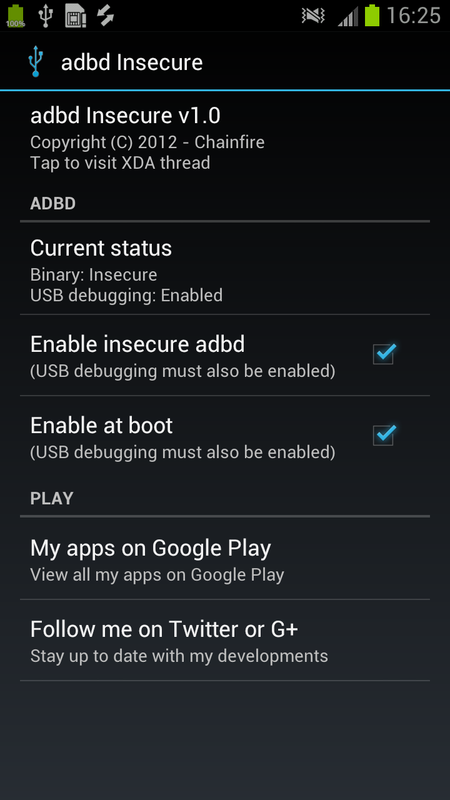 For most stock kernels, however, it seems that this only allows you to run adb in secure mode even if you have a rooted device. So, if you have a stock kernel and want to have all the goods that comes with an insecure adbd (write access to /system goodness and much more), you may want to take a long look at a new release by XDA Elite Recognized Developer Chainfire. He has released an APK that allows your device to run adbd in insecure mode, even if you are rooted and on stock kernel. The app doesn’t enable insecure adbd permanently, and will thus revert to the standard adbd upon reboot. However, there is an option to restart insecure adbd on boot. There is a good chance that if you are running a custom kernel, you do not need this app. Chainfire mentions that this app must be installed on rooted devices, and that it may not work if your device has a locked bootloader. Please take it for a spin and leave some feedback for the developer. You can find the free application in the original thread. Alternatively, you can purchase a donate version in Google Play.